There are those that will argue that teen resumes are presumptuous. 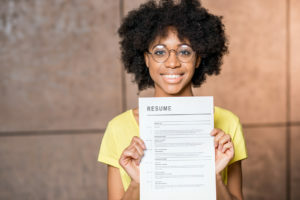 They certainly can be, but if done correctly, a resume for teens is a useful tool for multiple purposes. The first thing to keep in mind is that a resume for a teenager is NOT a business resume. We don’t want a list of adjectives describing the student. We don’t want stated objectives. This always looks pompous and defeats our purpose. Thus, the teen resume is humbler than the adult counterpart. It is just a highlight of how they spend their time. While traditional teen resumes have categories such as: cocurricular activities, extracurricular activities, leadership, awards, work experience, and education, I feel there is a better approach. For most kids’ resumes, I advocate a themed approach where everything within a certain overarching category such as Music or Debate stays together: the scope of the activity, leadership, and awards. At a glance, this will give the college interviewer something to ask about or give the teacher writing a letter of recommendation a more holistic picture of the student to frame their writing. However, if the resume is for a leadership scholarship, we change the format and start with in-depth highlights of leadership activities from all categories. If it is for a military academy, we emphasize things significant to those institutions such as Civil Air Patrol, flying experience, leadership, sports (both leadership and teamwork), and grades. If the resume is for a scholarship rewarding community service, we start with the total number of volunteer service hours, community leadership, and networking, etc. Interested in reading similar posts? And What Did You Do Last Summer? Is Opportunity Holding You Back?